The incredibly exciting performances of the 2008 World Championship Finals have just been released as digital downloads on Drum Corps International's online media platform, The Fan Network. 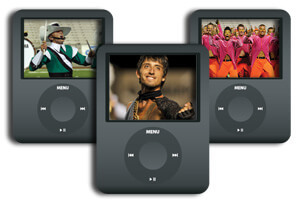 All 20 World Championship performances of DCI's '08 World Class corps are now available in both video and audio formats. From Phantom Regiment's Championship winning "Spartacus" to the Blue Devils' eccentric "Constantly Risking Absurdity" productions, they're all there ready for you to download and watch on your computer or carry along on your iPod or other digital device. Visit TheFanNetwork.org and click on "Download Performances" at the top of the page to get yours today!